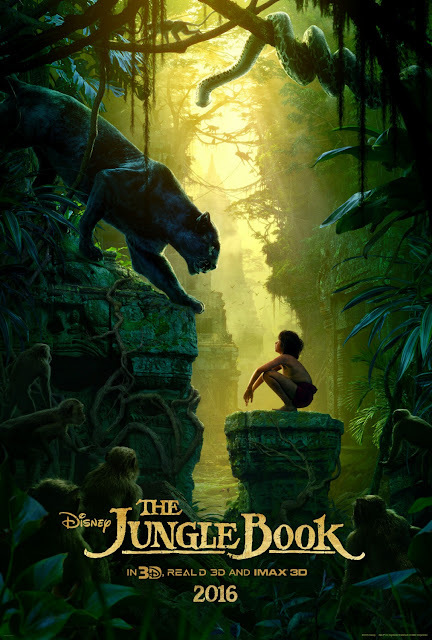 Chrichton's World: Review The Jungle Book (2016): It rocked big time! Review The Jungle Book (2016): It rocked big time! The day I went to watch Captain America: Civil War I also watched The Jungle Book right after. And while I was expecting a good film I got so much more than that. I could not be more surprised about the excellence that was The Jungle Book. Now I have seen many versions of the Rudyard Kipling story and most of them made me sad because of how awful they were. I enjoyed the Disney cartoon. And while it has a few unforgettable moments the film itself is not that memorable. I vaguely remember the one with Jason Scott Lee. As in I remember having watched it. But have no idea what transpired in that one. One I need to revisit for sure. So I was a little skeptic about this latest adaptation. Only after Mrs. P told me that it was really good I was convinced I was going to have a good time. Still The Jungle Book managed to top all of my expectations and blew me away. Like Civil War there was not a single boring second. Every event in the film mattered. Even the return of the musical numbers of the old cartoon struck a cord with me. I am not a big fan of musicals. (I do like the old school ones with Fred Astaire, Gene Kelly and Danny Kaye). But the current ones. No thank you. So if I say that those numbers were good then they were good. Of course in large part it's the nostalgic factor that is appealing. But also the energetic performances by Bill Murray and Christopher Walken have a lot to do with it. Then you have newcomer Neel Sethi as Mowgli. Wow! Just wow! He is only 12 and already acting like a character actor. Can't wait to see how he will do in future projects. The story of The Jungle Book is a simple one of course and like I said told many times before. And yet they managed to make it captivating and endearing. This film was filled with moments that got to you because they were so recognizable and sincere. Who cares then that most of the events are predictable and cliché. Seriously how often have you seen a live action adaptation done well? The Jungle Book has managed to make the cartoon come alive in a way that it never felt fake or animated. Most animals looked like they were real. And the sceneries were amazing. How can people not be impressed by that? Oh yes, you know who you are. The ones who have been hating on this film. I don't get it. From start to finish I was sitting on the edge of my seat. I mean for a Disney movie this one was quite dark and gritty and did not hold back. It showed nature as ruthless as it can be. Plus it managed to combine all of that with some much needed light and comedic moments. Please ignore the haters. The Jungle Book in essence is an old school adventure film that brings you into a magical world and will dazzle you if you let it. It's incredible intense, fun and entertaining. How anybody can dislike that is beyond me. A must watch if you ask me!